We see lego models and artworks of cool spaceships or flash cars from films or massive castles all the time , but every so often a moc of something with a strong meaning or political message pops up. 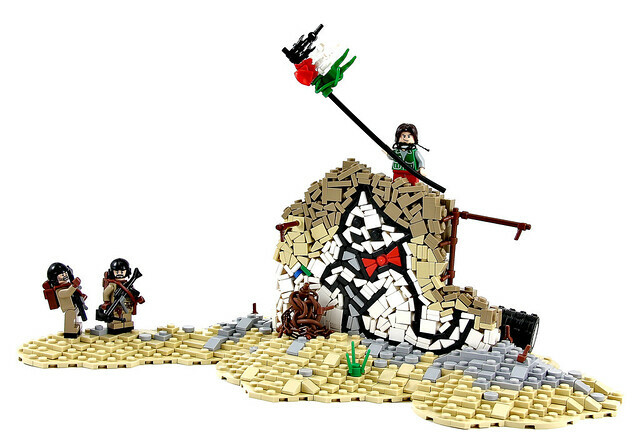 'Welcome to Gaza' by TheBrickAvenger is one of them. The message this moc conveys is very powerful, and brings the moc into another level of 'wow' factor, as it brings fourth an empathy to a real world situation which shouldn't be ignored. Not to mention the execution of the moc is absolutely stunning, some brilliant complex techniques which must have been a pain to pull off, combined with the beautiful simplicity of the base, really sells this composition of bricks.